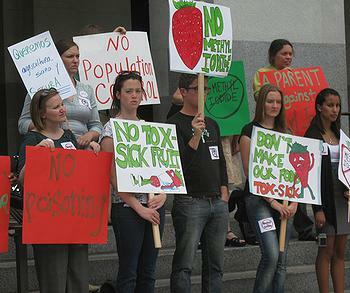 SAN FRANCISCO, California, January 5, 2011 (ENS) – A coalition of farmworkers, community advocates and environmental health organizations is suing to challenge California’s approval of the carcinogenic strawberry pesticide methyl iodide. The lawsuit was filed December 30, 2010, in Alameda Superior Court by Earthjustice and California Rural Legal Assistance, Inc. The plaintiff groups are: Pesticide Action Network North America, United Farm Workers of America, Californians for Pesticide Reform, Pesticide Watch Education Fund, Worksafe, Communities and Children Advocates Against Pesticide Poisoning as well as farmworkers Jose Hidalgo Ramon and Zeferino Estrada. Several of the organizations also submitted comments from over 52,000 members of the public urging California Governor Jerry Brown to act quickly to prevent the use of methyl iodide in California’s fields. The suit challenges the state Department of Pesticide Regulation’s December 20, 2010 approval of methyl iodide for use in California on the grounds that it violates the California Environmental Quality Act, the California Birth Defects Prevention Act, and the Pesticide Contamination Prevention Act that protects groundwater against pesticide pollution. In addition, the suit contends that the Department of Pesticide Regulation, DPR, violated the law requiring involvement of the Office of Environmental Health Hazard Assessment in the development of farmworker safety regulations and made an unlawful finding of emergency with its request for Restricted Materials status for methyl iodide. Methyl iodide causes late term miscarriages, contaminates groundwater and is so carcinogenic that it is used to create cancer cells in laboratories, the plaintiffs point out. It is included in California’s Proposition 65 list of chemicals known to cause cancer. Methyl iodide is marketed as Midas by Arysta LifeScience based in Cary, North Carolina, a global provider of crop protection and life science products that is a subsidiary of The Permira Funds. The plaintiffs contend that in deciding to approve methyl iodide for use on strawberry fields, DPR ignored the advice of members of the state’s Scientific Review Committee, who have said that the chemical is too dangerous to be used in agriculture. In 2007, U.S. EPA registered methyl iodide, also called iodomethane as a fumigant. Based on its acute inhalation toxicity, U.S. EPA designated methyl iodide as a federally restricted-use pesticide. All but two other states have also registered the chemical. Injected into soil before crops are planted, the fumigant spreads through the soil to kill weed seeds, plant diseases, and nematodes. It can be applied by drip irrigation under a protective tarpaulin, or injected into the soil using a tractor that automatically places a tarp over the ground after application. In its “Finding of Emergency” authorizing the use of methyl iodide, the Department of Pesticide Regulation said the new chemical is being phased-in as the ozone-depleting fumigant methyl bromide is being phased out as required by the Montreal Protocol. “The primary reason is that methyl iodide does not harm the Earth’s ozone layer,” the agency said. The DPR said its decision to register methyl iodide will allow the users of methyl bromide to begin replacing methyl bromide with methyl iodide, beginning with the 2011 fumigation cycle which in some counties begins in January, and statewide, is in full swing by March. But the plaintiffs claim that the “emergency” does not exist except to lock in the methyl iodide registration under the administration of Governor Arnold Schwarzenegger and before Governor Brown took office on January 3.